Caltrain is a regional rail system serving Gilroy, San Jose, San Francisco, and cities in between. 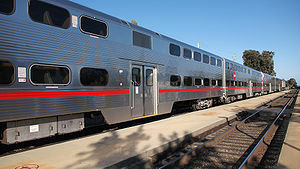 Caltrain connects with other rail systems in the region such as BART, Muni Metro, VTA Light Rail, ACE, and Amtrak, along with local bus systems like Muni, SamTrans, and VTA. Shuttles are also available at many stations to connect the train with nearby destinations. Caltrain offers extensive limited stop service (including the Baby Bullet) during the weekday peak hours. Between San Francisco and San Jose, service is available throughout the day on weekdays and weekends. Limited service from Gilroy is provided on weekdays only. Before boarding the trains, buy your train ticket from a Caltrain ticket machine, or tap your Clipper Card. Fares on Caltrain are determined by the number of fares zone you plan to travel. Caltrain uses the proof of payment system and passengers caught without a valid ticket or pass are subject to eviction and/or citation. Make sure to look at the train schedule for the departure times and station stops. During the weekday peak hours, all trains will skip some station stops, even the more popular ones like Palo Alto and Millbrae. If you are not sure if a particular train makes your stop (like when trains are delayed), ask the conductor at the station. Trips between minor stops during peak hours may require a transfer. Every trip on the train schedule has a train number (like flight number). Train numbers are used by the train crews and displayed on the digital message boards installed at most stations. Caltrain has one of the most generous onboard bicycle policies in the country. See Caltrain bicycle access for details. Free shuttles are available at many suburban Caltrain stations to nearby employers. If you ride with your Clipper Card, you'll need to tap on a Clipper reader again after exiting the train, so that proper fare will be charged. 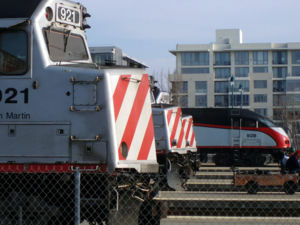 Caltrain is accessible to people with disabilities at all stations except 22nd Street, South San Francisco, Broadway, Atherton, Stanford, and College Park stations. Riders who are unable to use stairs can board the train by waiting on the blue boarding assistance square painted on the platform (generally located near the middle-north end of the platform). Conductors will deploy the wheelchair lift. Some stations have a mini-high platform located adjacent to the blue square. The platform provides level boarding onto low floor Bombardier trains. To board those trains, conductors will deploy a ramp to bridge the gap between the vehicle and the mini-high platform. Disabled parking is free at Caltrain stations.